The 2018 Rally is coming soon! The annual rally is fast approaching with just 2 weeks to go. It’s not too late to get an entry in. We’ve already got a great entry and a fantastic selection of vehicles coming along to Deeside activity park on Sunday 10th June. Hope to see you there in the sunshine.! As mentioned at this years rally we intend to have a 60th Anniversary coffee afternoon on Sunday 30th July. This will be held in the function suite at Pittodrie Stadium. It would be great to see as many of our members, both old and new, attending with classic and historic vehicles. We have secure parking in the members enclosure for over 200 vehicles. ​There will be a £5 charge per person to go towards the cost of the venue and refreshments. For those of you who are interested please contact me via the "Contact" Page. Thanks you and look forward to seeing you on 30th July. Destination this year is the N.T.S. property, Drum Castle, Drumoak. The Coffee Stop will be at the Royal Deeside Railway Centre at Crathes. The run is about 36 miles long and will take about 1½ hours. The run will meet at Aberdeen Beach Esplanade at 9:30 am. Line up along the Esplanade from the Beach Ballroom towards the Bridge of Don. If we all point north and park at an angle this should make a good photo opportunity and make parking easier. The run will set off at about 10:00 along the Esplanade to the Bridge of Don. Turn left onto King Street then onto Union Street and Holburn Street. At the roundabout take the second exit onto Great Southern Road. Keep going until you cross the bridge over the Dee. Turn right and continue to the next roundabout at the Bridge of Dee. Take the second exit onto Leggart Terrace and continue onto the South Deeside Road. At the junction turn right and cross over the Dee at Durris Bridge and turn left. Continue to the Royal Deeside Railway Visitor Centre at Milton of Crathes ½ mile on the left. The Society has kindly opened their Carriage Restaurant for us again so that we can have a coffee stop and tour of their centre. At 11:30 we leave the site and turn left. At Banchory turn right into Hill of Banchory West Road. Continue until you get to the T junction with Raemoir Road. Turn right and continue to the junction with the B977. Turn right. After 5 miles turn right just AFTER Lora’s Restaurant, signposted HOPTON. At the T junction turn right and follow the signs to the Castle entrance. Before you reach the castle turn left signposted FARM. Follow the road round to the rear of the castle. Park on the grass using the ramp provided. There will be limited catering available so packed lunches are recommended. The N.T.S has gone to some effort to prepare for our visit so please take a tour to the Castle and have a walk around the gardens. It would be appreciated if you can stay at least until 3pm. We had a record entry this year with 102 vehicles prebooked for the annual rally held at Deeside Activity Park near Aboyne. As always there was a great collection of polished chrome with vehicles ranging from a 1904 Century through 1930s Rolls Royce and Bentley to the line up of 80s Porsches. There was also a lovely selection of MGs spanning 6 decades, the earliest being a 1933 J2. Despite the wet Saturday and damp start to Sunday morning, the lawn was full by 11am and judging was in full swing with the team of 10 scrutinizing every detail. All entrants had a chance to experience judging for themselves when they selected their favorite vehicle for the Peoples Choice award. This was very popular with reasons given for choosing the particular car such as 'a car they always wanted but couldn't afford' or simply because they 'loved the colour'. A new award this year, The Harpers Trophy for the best Ford, was presented to John Dawson and his 1986 Ford Capri Laser which he actually bought new from Harpers in Aberdeen and has owned ever since. The majority of the entry enjoyed the road run taking in 36 miles of picturesque Deeside B roads around the Activity Park. And on return the awards were presented for each of the categories. The run will meet at the Aberdeen Beach Esplanade at 9:30am and depart at 10:00. Destination will be Aden Country Park at Mintlaw. ​We had 66 entries in the programme with a further list of late entrants who missed the cut off. In the end we had a further 30 late entrants turn up on the day bringing our grand total to 96 cars. This exceeds last year's entry and is our biggest yet at Deeside Activity Park. We had a wide variety of vehicles spanning no less than 10 decades. Our earliest vehicles was the 1923 'New Hudson' motorcycle closely followed by the 1924 Cluley 2 Seater. There was a wide range of vehicle classes represented too, Military and Commercials as well as the Vintage Motorcycles and Vintage through to Classic Cars . Over half the vehicles chose to take part in the road run which saw them enjoy the scenic forty three mile route through Deeside around Finzean and Strachan before returning back to Dess. Fordson Tractor - Where is it now? 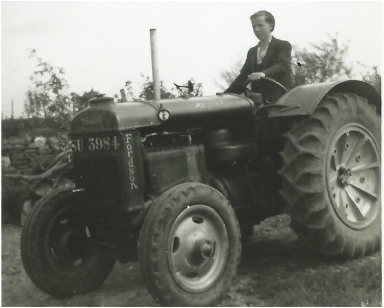 A Club member is looking for a tractor which was owned by his grandfather. It is a Fordson, reg number SU 3984. If you know if it is still around please let us know & we'll pass on the information. Wanted - Cars to Feature in Press & Journal! Every week in the Press and Journal’s Your Car supplement, we celebrate all different types of cars from track and rally to vintage and classic. For our Me and My Car platform, we are looking for candidates to tell us about their vehicle. You would need to be interviewed and photographed with the car. We are also looking for people with vintage and classic bikes for a similar feature. Anyone who would like their car or bike featured should emailCheryl.livingstone@ajl.co.uk with details of the car and contact telephone number and address. With the better weather fast aproaching we find ourselves thinking about getting the old car out for a drive. What better way to do this than join the Garioch Drive it Day run on Sunday 26th April. Setting off from Aberdeen beach, as we have done in the past few years, members of KVVVC will join GVRS on a scenic trip to House of Dun. For more details please use the link below which will take you to the GVRS website. The Kildrummy Veteran and Vintage Vehicles Club will run its 58th Annual Kildrummy Vintage Rally and Run on Sunday 14th June 2015 at the Deeside Activity Park at Dess on Royal Deeside. Set in picturesque countryside the activity park offered a fine lawn for the interesting vehicle display, and the venue has lots of activities and attractions to add to the interest for passengers and family of the vintage car enthusiast. We run a Concours competition and an hour-long road run in the scenic area around the venue. In previous years, numerous older vehicles were entered in the classes including veteran, vintage, post-vintage, and classic vehicles. The bulk of entries were motor cars but classes for commercial vehicles and motor cycles were also represented and all are welcomed to enter our 2015 Concours. We look forward to filling the field again at the activity park and enjoying some more Royal Deeside sunshine. If you have any questions about the Kildrummy Vintage Rally, please contact us using the button below.